The PCE- 228 M pH meter has two calibration points, which can be done manually with two trimmer on the side of the device, protected under a cover. The PCE- 228 M pH meter is powered by a 9V battery which is included in the delivery. The PCE-228 M pH meter is very useful to perform sporadic pH measurements. At this link you will find a pH meter with a solid and water resistant case. It includes a pH electrode with a steel blade and a steel temperatura sensor. 0 ... 50 °C máx. 80 % H.r. 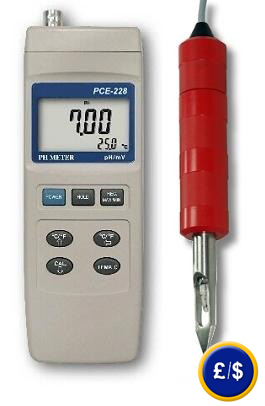 1 PCE-228 M pH meter, 1 CPC-OSH-12-01 electrode, 1 temperature sensor and user’s manual. The battery is not included!